Infrared wedding image from Harbour Ridge. April 01, 2017. This is a great example of an infrared wedding portrait from a recent wedding at Harbour Ridge Golf & Yacht Club in Palm City, Florida. Infrared captures are not some trick of photoshop, but rather are accomplished thru the use of dedicated professional dslr cameras custom modified to "see" into the infrared portion of the light spectrum which is normally invisible to the naked eye. 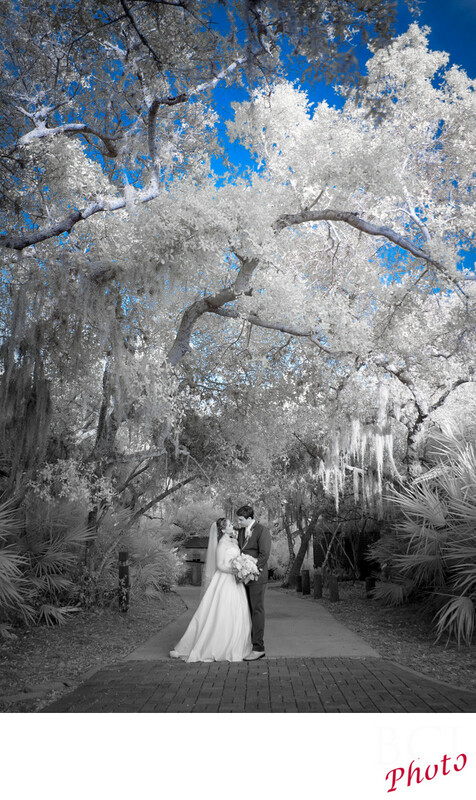 We have pioneered the use of infrared imagery for weddings, and have done so for more than a decade. In the infrared wedding portrait shown above, we have chosen to use a technique known as color channel swapping which allows the skies to retain their normal blue appearance while the rest of the image is essentially monochrome (black and white) which renders a simply amazing wedding image like you see here. This infrared image works just as well in true black and white, or our custom chocolate flavored (brown toned) treatment. Due to the way infrared light is reflected off any green foiliage ie trees, grass, etc, the images rendered from our infrared captures take on a mystical and ethereal quality that other images simply can not. Certainly, they are not a substitute for a good visible light image, (which of course we also shoot at the same time), but the collection of infrared images is quite often from where the bride and groom choose their favorites to use as the album cover, thank you card image, or most often to display as a fine art wall hanging due to its incredible wow factor and total uniqueness. If you'd like unique and powerful wedding images for your wedding why not give us a call or text today at 772-336-5798. Or shoot us a message HERE!